Chevrolets chevelle ss (for super sport) was introduced for 1964, but its true debut as a muscle car came in 1965, when the first of a limited edition of 200 equipped with a new 396-cu.-in. V8 engine was unveiled. A test driver who compared it to the jaguar xke took a souped-up 375hp model from zero to 60 mph in about 6 seconds and to 100 mph in about 16 seconds. Dont spare the horses in the 60s, many people ached for a car like the classic mid-50s chevys. 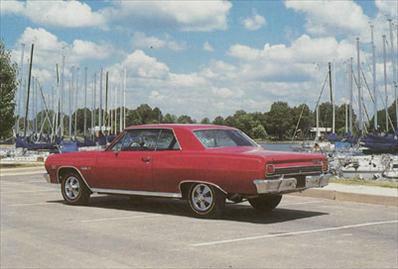 The 1964-65 chevelle malibu ss came close, but the 1966-68 ss-396, with 325-375hp engines, was the one with the juice, thanks to its hydraulic camshaft and mark iv porcupine cylinder heads. Special suspension and shocks were part of the deal, and customers also got a blackout grille, simulated hood scoops and red-striped tires. The package also included ss emblems, rocker-panel trim and special rear-cove treatment. later years the ss-396 wheelbase was reduced from 115 to 112 in. For 1968. There were special body accent stripes and a twin domed hood, and black finish was now used on the entire lower body perimeter. For 1969 and 1970, the ss-396 was an option package for chevelle 300 coupes and malibu coupes and convertibles rather than a distinct model.